Preheat oven to 180ºC (355ºF). Place the flour, icing sugar, almond meal and lemon rind in a bowl and mix well to combine. Add the eggwhite and butter and mix well to combine. Pour into a lightly greased 25cm-round cake tin lined with non-stick baking paper. Bake for 25–30 minutes or until cooked when tested with a skewer. Allow to cool in the tin for 10 minutes, then turn out onto a plate. To make the lemon sour cream, combine the sour cream, lemon juice and sugar and set aside. To make the candied lemon slices, place the sugar and water in a saucepan over medium heat and stir to dissolve the sugar. Add the lemon and bring to the boil. Cook for 12–15 minutes or until the syrup has thickened and the lemons are translucent. 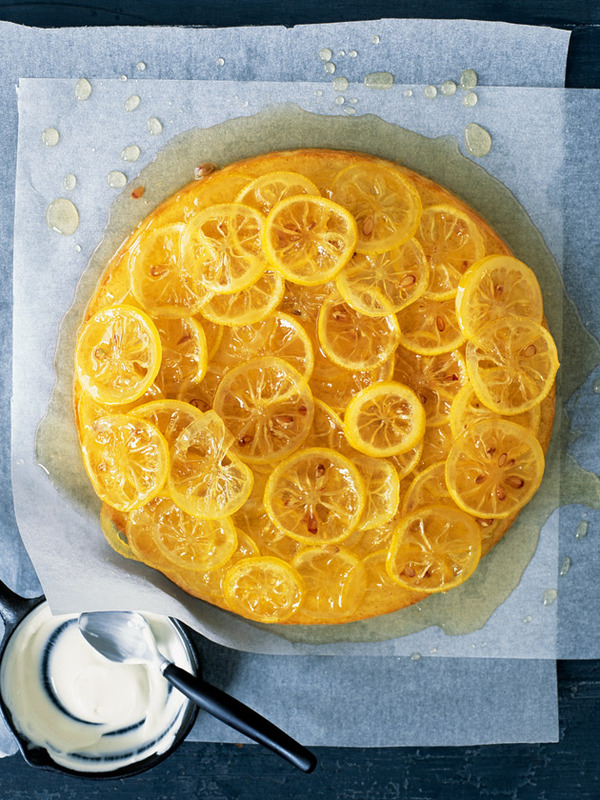 Pour the syrup over the cake and top with the lemon. Allow to cool and serve with the lemon sour cream. Serves 8.